Afternoon Tea at Colonnades, Signet Library, Edinburgh – Why Waste Annual Leave? Ever been accused of gifting to others what you secretly want yourself? I admit that I have been guilty of this on many occasions (apart from that time I bought Pumpkin a metallic blue, multi-purpose, mini screwdriver from the Danish design museum in Copenhagen a few months after we had met.) That was a gift he could rest assured had been given with only the recipient in mind; you only need to know me for two minutes to know that my DIY skills are comparable to an average toddler. This was to be our maiden visit to Edinburgh Fringe Festival and in my defence, ordinarily, I would have taken him out for a slap-up evening meal but with the risk of formal dinners clashing with performance times, afternoon tea seemed like a safer bet and always has a way of feeling like a celebration in itself no? Still not convinced? My feeble arguments wouldn’t withstand the legal process but it is the outcome that matters and my motives aside, the outcome here was that Pumpkin loved it. Afternoon Tea at the Colonnades at the Signet Library in Edinburgh was anything but ordinary. And aside from cheeky bloggers trying to squeeze in extra scones in the name of spousal birthdays, there are a whole cohort of you, who I believe will be just as enamoured with the Signet Library Afternoon Tea as we were. Who should try Afternoon Tea at Colonnades? If you’re up to date with all the Man Booker Prize titles, are old enough to keenly remember the days when reading involved turning actual paper pages or if you have fond memories of sifting through what seemed like an oasis of literature at the local public library as a child, then this is the afternoon tea for you. Armed with no knowledge other than a brief mention about husband’s birthday typed hastily in the online booking notes, the staff at the Colonnades Restaurant went out of their way to make the celebration a worthy one with a beautifully positioned table in a private alcove of the library, allowing us to dine in a bubble of relative privacy and immerse ourselves in the smell of old law books. The Maitre D wished Pumpkin the moment we arrived and in an innovative break from the norm, instead of inserting a candle into one of the afternoon tea cakes, he was treated to a round of greetings and a flame standing tall in the centre of a scoop of mango sorbet. Shock horror, right?! Because if you’re reading this post, then the chances are you’re probably already in the sub-sect of human beings that are partial to a cupcake (or five). You and I, however, would be surprised to learn that not everyone appreciates paying hefty prices for sandwiches and scones that we could potentially bake ourselves at home for a tiny fraction of the cost. But that’s where the Signet Library Afternoon Tea comes along to silence cynics. With everything from an amuse bouche to a palate cleanser, mini sliders to cheesy canapes, this tea felt like a cross between a classic afternoon tea, a wedding reception and a Michelin star lunch and I most definitely could not have recreated any of these offerings in my own kitchen. If you thought this would be just another cheese and pickle sarnie, think again. You know those people who have been there, done that and got all the afternoon tea-shirts (pardon the terrible pun?) Well Pumpkin thinks I’m one of them and whether or not he is right, this afternoon tea had the wow factor. With its refusal to conform to the usual conventional formula of predictable sandwich fillings, the versatility of the menu (savoury and sweet) and the unique setting, this is an afternoon tea pin badge even the most ardent tea fans will be wanting to add to their collections. I’ll pack my bags and check myself out of this category with haste because for me, personally, afternoon tea is all about sugary decadence. Give me an extra macaron over an spare tuna sandwich any day and what on earth is the point of allowing your scone to go cold and dry and neglecting the luscious clotted cream that stands dutifully beside it in the name of a morsel of cucumber and blob of cream cheese. No logic as far as I am concerned but I’ll let you take that up further with the pathological sweet tooth that writes the blog half the time. Some of you, however, have more virtuous arteries and rumour has it, even prefer savoury?! We may have nothing in common but I still want to tell you that unlike so many other afternoon teas I have been to, the savoury bites here refuse to be sidelined by delicate chocolate tempering and fiddly sugar craft. At the Colonnades, Team Savoury holds its own against Team Sweet and it’s the closest duel I’ve come across yet with an array of treats including brie and sesame truffles, mini pork sliders and tartlets cute enough for a doll’s house. AND aside from filling one level on a 3-tiered cake stand, here the savoury options are a 3-tiered stand! Wear the stretchiest joggers and log out of that calorie counting app – you are about to be defeated. For us, this tea could not have been any more of a perfect pit stop from the Fringe festivities. 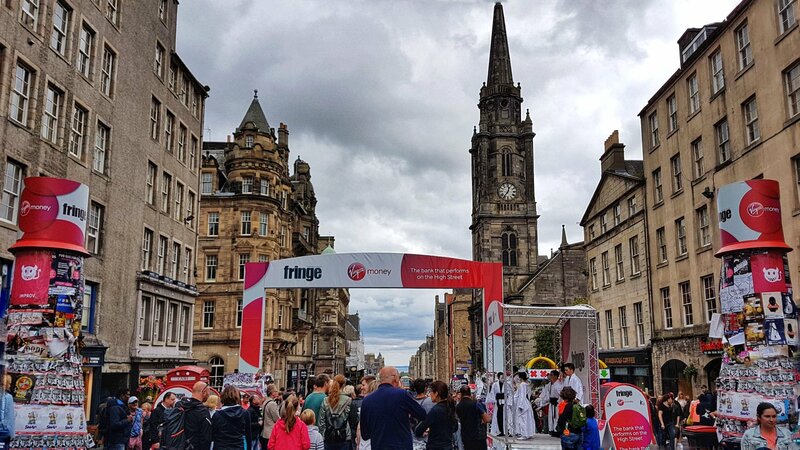 Fringe is fabulously fun and lively, all the more so when you are blessed with an uncharacteristic weekend of blazing rays but it does get crowded and busy. Your walking velocity down the main streets are largely dictated by however many hundreds ahead of you are trundling along at their own pace and whilst the whole city is flooded with options for light bites, street food and even the Edinburgh cocktail festival that was going on when we were there, there is nothing like a moment of quiet in a serene space to flee the madness. A husk of cake and a cup of solid builder’s brew later and we left Colonnades with batteries recharged and re-fuelled for our next mad dash around the city. And could there be a more convenient location for this transient escape than right in the middle of Parliament Square in the heart of Edinburgh’s old town, a stone’s throw away from all the action and surrounded by an abundance of street performers who vie for your attention if you happen to arrive outside the Colonnades just that little bit too early. Me too Sha!! But for me, it would have to be ice cream rather than sorbet if I were sacrificing cake 😁 The tea was definitely one of the loveliest settings I’ve seen – could have happily spent another hour curiously looking at what kind of books were in the rest of the library! You say feeble arguments, but I’d call it strategic enjoyment! He’s happy when you’re happy, right? what an incredible spot! Love the look of it and the cakes are quite magnificent if a little brightly coloured! Haha, they are actually quite bright aren’t they Andy – I’d been too absorbed in eating them & the library setting to have even noticed that! That’s so amazing. Love the setting and the presentation. The goodies looked fantastic. It was one of the loveliest, most original afternoon teas I’d ever been to! Awww now here’s an even bigger reason for me to visit Edinburgh! I love a good library and I strangely have a thing about being surrounded by books! The tea offering itself looks pretty good as well! Considering that it was such a last minute trip to Edinburgh Honey, I totally fell in love with the city! Could happily see it being the kind of place I could live in! The tea is so worth a visit. The setting is so gorgeous yet still relaxed & informal & such a fab spread of both savouries & sweets! Wow Shikha, what an amazing setting for afternoon tea and what an impressive spread. This has just gone high up on my afternoon tea bucket list, oh and I wish I hadn’t read this while dinner’s cooking – I’m starving now! You would LOVE this afternoon tea experience Keri! I thought the 3 tier stand just of savouries was such unusual twist & then the desserts came along & were every bit as good! Don’t know how I’ll convince myself to try any others wherever I’m next back in Edinburgh! Well I feel like a traitor to myself saying this Emily but the savouries were so good here that I may have even slightly I preferred them! I think that’s why Pumpkin did enjoy – the whole environment & experience didn’t feel too girly girly or saccharine & for once, there were just as many men in the tea room as there were women!! This looks utterly amazing. This place was recommended to us as well as Prestonfield House and we chose to go there instead. It was beautiful, delicious, and lovely, but the food at the Signet Library looks extra amazing! Will definitely have to go next visit. It’s such a good one – one of my favourites to date including many of the fancy London ones I’ve been to – definitely recommend it! I think their wide range of savoury options helps as it sets it apart but if you’re a book or library lover, there’s no bearing that location!